Hard to believe that we are already half into 2016! This year has flown by. If you have not been around for a while, in late December 2015 we packed up and left Hawaii for our new and permanent home in Washington State! We had a house built here, everything has arrived and I am pretty much settled in except that my better half has been gone from me pretty much since January. So while it’s been a long separation, due to needing to take possession of our home and him deploying…he will be home in a few months time. So, did you know today was Nation Donut Day? Now that I am settled into my new home I am now wanting to bake…a lot, and I have the last 3 days in a row, so I’ll have more recipes to share with you soon. Many people seem to be put off by baked donuts because of texture. Do not let that stop you from testing and tweaking recipes! Since baked donuts are not fried, it won’t be a donut like you would pick up from Dunkin Donuts or Krispy Kreme. Baked donuts can also be a healthier alternative since there is no frying. I love this donut. It is moist, soft and simply amazing right from the oven hot! The recipe states to use unsalted butter for the topping when you go to put on your cinnamon sugar mixture but I would highly recommend using salted butter. It just adds something so wonderful to the taste of the cinnamon sugar topping! These are easy to whip up with no odd ingredients which makes them super easy and fun to make on a whim. Preheat the oven to 350 degrees. Spray 2 doughnut pans well. Into a large bowl, sift together the flour, sugar, baking powder, cinnamon, nutmeg, and salt. In a small bowl, whisk together the egg, milk, melted butter, and vanilla. Stir the wet mixture into the dry ingredients until just combined. Spoon the batter into the baking pans, filling each one a little more than three-quarters full. Bake for 17 minutes, until a toothpick comes out clean. Allow to cool for 5 minutes, then tap the doughnuts out onto a sheet pan. For the topping, melt the 8 tablespoons of butter in an 8-inch saute pan. Combine the sugar and cinnamon in a small bowl. 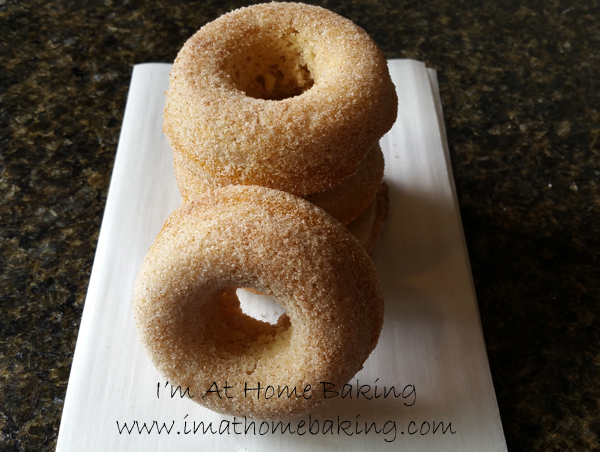 Dip each doughnut first in the butter and then in the cinnamon sugar, either on one side or both sides.